From cheesy mugs to hilarious cards. Man gives heartshaped balloon to woman. Valentine's Day is just around the corner, which means you may already be planning ahead for the special man in your life. 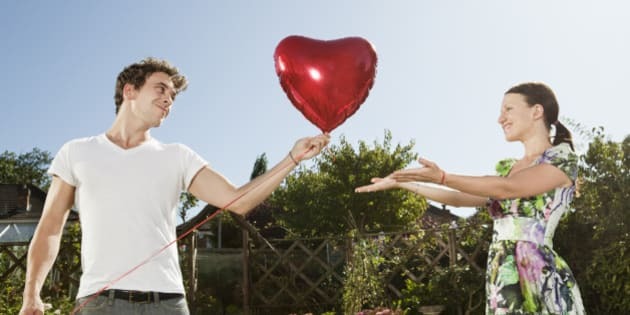 Whether you're an old school romantic and prefer dinner and a homemade gift or if you're more practical and would rather give a gift he can use, V-day is the perfect day to remind someone how much they mean to you. Below, we've rounded up 25 of our favourite romantic gifts for the husband, boyfriend or friend in your life — although we would like to add these gifts can work for anyone. From cheesy mugs to hilarious cards to trendy staples for his closet, here are some ways to say, "I love you," on Valentine's Day.